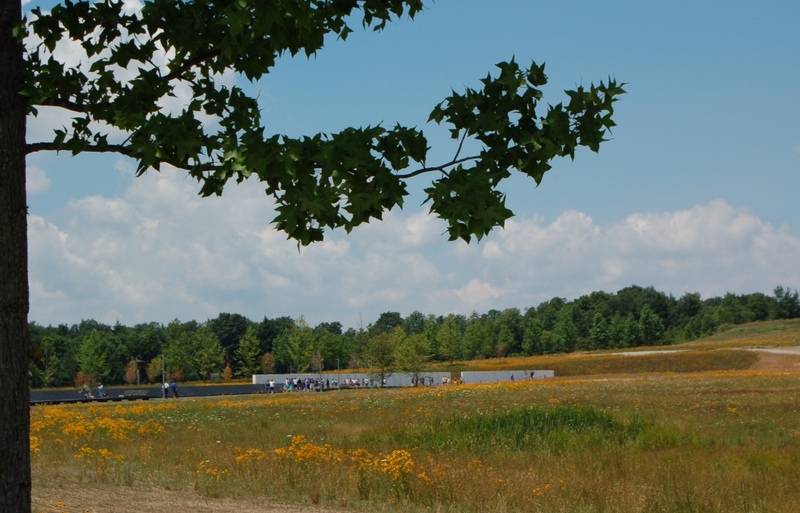 The memorial plaza for United Flight 93 in Shanksville, PA. Photo: National Park Service. Here's a response of sorts to our post last week looking at ridership in corridors where Metro built rail. Writer Nate Berg has a couple thoughts — rail doesn't always mean geographic equity and population growth may be a factor in the ridership surge. Even as the Republicans, including presidential candidate Mitt Romney, take aim at privatizing Amtrak, the railroad continues to set ridership records. Democrats are more protective of the railroad and the federal subsidies it requires to operate. Looks like San Francisco Muni is going to purchase 45 of the diesel-electric hybrids that are manufactured in St. Cloud, Minn. Since buses are often stopped to pick up passengers or at traffic signals, this seems to me a particular good use of hybrid technology. I don’t see anything wrong with privatizing Amtrak, at least in portions like breaking off the more successful ones like the NE Corridor or the Pacific Surfliner to private enterprise. These corridors are successful enough that they can start to be run for-profit without taxpayer support. The Acela for example, is breaking ridership numbers year after year as people are getting frustrated in using dinky commuter jets and dealing with the TSA hassles and weather delays just to get between NY and Boston or Washington DC. It doesn’t have to be an all-or-nothing solution, Amtrak can slowly be given back to private enterprise on specific routes where that have a higher chance of succeeding than being burdened with budget constraints for the sake of the more poorer operating routes. With that being said, why do we even need Amtrak routes that serve LA to Chicago? We don’t need rail at that distance where planes are better. Why should the LOSSAN corridor have to suffer with budget constraints for the sake of operating LA-Chicago? If there are routes that Amtrak can work without government support, sell it off. More tax funds would become available for those that are in need. Why should we keep using taxes to support the NE Corridor when they are making so many gains when we desperately need the funds to improve the Pacific Surfliner routes and our high speed rail plan? Sell the NE Corridor and Acela services to Japanese or French rail consortiums. They’ll get it running better, faster, efficiently and for profit better than under government ownership. Both of the earlier posters,regarding sell-offs, privitization, and foreign ownership, never indicate whether or not theyve traveled by Amtrak. Especially within the last 5 years. Certainly in the last 3. The service has improved tremendously, particularly on routes here in California, both short and long. The Coast Starlight, a coastal scenic wonder,has once again revived First Class. Something they’ve not had in over 40 years! The private owners dropped that first! The San Jauquin, which goes up to the Bay Area and through the middle of the state, has enjoyed increased ridership every year for the past 5 years. It now rivals the NE corridor, as the second most heavily used route in the United States. As to the Los Angeles to Chicago(the Southwest Chief)not being needed, there are lots of little towns and cities that don’t have any air service, after being dropped by the private carriers, because of it being unprofitable or low in demand. Oh, and what about the Japan and French private consortiums? In both of their respective countries, the train service is extensive, fast, reliable, and still very much a viable part of their overall transportation options. Probably the most important aspect of any of this, is that they’re publicly subsidized. Not privately owned. Could they know something that we just can’t accept or know? I thought the popular routes are now being used to subsidize the low-performing routes. Selling the good ones away would doom the remaining, currently subsidized ones. I travel a lot for business. When going from LA to Seattle, Amtrak is not my first choice. Why would I want to spend over two days getting there when Alaska Airlines can get me there in three hours? I don’t care about scenery, I care about getting there and meeting my clients as quickly as possible. When going from LA to San Diego, the Pacific Surfliner is a choice for me over the plane. It takes as much as the same time going to LAX, getting past security, dealing with hassles of air travel, all for less than 30 minutes in the air. At distances that are short as LA to San Diego, I’m better off hopping onto the Pacific Surfliner and get going. It’s all about efficiency. There are certain routes that air travel is better and there are certain routes where rail is better. Can Amtrak get me from LA to New York in less than a day? No. Is the plane any better for short intra-city distances? No either. Last I checked, people can buy JR East COMPANY stocks on the Tokyo Stock Exchange, where we cannot buy Amtrak stocks on the NYSE. So the Shinkansen and rail services provided by JR East is it a for-profit private enterprise? If not, why is it called a “COMPANY” instead of AGENCY? Hey, I would buy Amtrak’s NE Corridor, Acela service, and Pacific Surfliner stocks if it were available on the stock market because I believe that it’s a good investment and would make lots of money to fund my child’s education. Wouldn’t you? Or are you fine with being burdened with more taxes that makes everyone poorer? Privatize certain routes of Amtrak. I’m all for it. Maybe you need to check on your facts how other countries run mass transit. Japan JR East: Privately owned corporation, anyone can buy JR stock. For profit enterprise. One of the best and high tech mass transit systems in the world. Hong Kong HKMTR: Privately owned corporation, anyone can buy HKMTR stock. For profit enterprise. One of the best and high tech mass transit systems in the world. Singapore MRTC: Privately owned corporation, anyone can buy Singapore MRTC stock. For profit enterprise. One of the best and high tech mass transit systems in the world. USA’s Amtrak: Government owned and 100% taxpayer subsidized, no one can buy Amtrak stock. One of the worst and outdated transit systems in the world. If you haven’t noticed, the USA is a capitalist country. We are not Communists. Everywhere they believe in capitalism, they have privatized mass transit. The global standard IS privatization. Or do you think we should let big brother government take over and run everything that has to do with transportation? Should the government take over our airlines and our car companies as well? Well that idea clearly didn’t work in the old Soviet Union (if you recall, they collapsed back in 1992), it sure as won’t work here. If you think government should run everything and seem to be fine with Communism, you are free to move out of this country and go to North Korea or Cuba. Let’s see how you like it where everyone is poor with no room for private enterprise. I don’t know why people get upset whenever the topic of privatization of Amtrak comes up. A lot of things are for private enterprise and they all work fine. Why should Amtrak be any different? Private enterprises work far better than government anyway. Name me one thing government has done things efficiently in recent years. Absolutely nothing. I would rather have the opportunity to directly invest in Amtrak than have it paid for by taxes. Less strain on taxes, the better. I pay too much taxes in this state anyway. I want to see my taxes drop because my paychecks surely aren’t getting any bigger. +1 on privatizing certain parts of Amtrak. We are living in a tough economy. We need to cut back on government services. We can’t have everything from health care reform, military, space program, national park services, etc. Something has to be spun off into private enterprise in order to reduce government spending. Our country is badly in debt as it is. And if certain routes on Amtrak like the NE Corridor can run on profit, why should we keep borrowing more money from foreign countries and keep funding then with our tax dollars? Privatize the NE Corridor and redirect those funds to improving other Amtrak routes. Let the investors pay for improving the NE Corridor now; because if it makes profit, they’ll invest in it. The funds that used to go to the NE Corridor can now then be redirected to improve our Pacific Surfliner. We surely could use the funds to electrify the Pacific Surfliner just as much they did to the NE Corridor. I wish to see something like the Acela between LA and San Diego!